A great beauty product on its own is quite a nice discovery, but I get a bigger kick out of when two different products come together to make something downright amazing. These are my favorite dynamic duos and why I love them even more together than apart. Everyone knows my obsession with the Urban Decay Naked Skin Concealer, but some days I need a little more oomph to cover up a bad night's sleep. Adding the Bobbi Brown Corrector on top of the concealer gives the added coverage I need while cancelling out any serious undertones. The Bobbi Brown Corrector on its own just doesn't have enough coverage for day to day wear lately, but with the UD Concealer you couldn't even tell I was up until two binge watching The Office. I like a mascara that can hold its own, but for special occasions I may combine two together for even more length and volume. My favorite pairing is Maybelline's The Rocket Volum'Express and the Lancome Hyponse Drama. Lancome's offering lengthens more than Maybelline's while Maybelline's provides serious volume. Together my lashes go on for miles and miles of volume. Both the bareMinerals Complexion Rescue and the Make Up For Ever UltraHD Foundation are great on their own, but I love what happens when I combine the two together. You've seen me go on and on about the Complexion Rescue so I'll just give you the highlights. It's as light-weight in texture and feeling on the skin as it is on coverage. Nothing but a dewy finish and a decent lasting power. The Make Up For Ever Foundation is a bit more satin/matte in finish and a lot heavier coverage. Together I get the best of both world's and a coverage that's exactly what I'm looking for. Plus they last even longer on the skin when teamed up. For primers I've been loving a mixture of Stila One Step Correct and Make Up For Ever's Hydrating Primer. Both pack a punch in the hydration department and when I'm looking for something extra to help out my winter skin these two make the perfect pair. There's not much visible difference when they're combined, but it makes all the difference in feeling and moisture. Hair is something I don't like to over-complicate so my routine usually will only consist of these two products anyway. The LivingProof PHD 5-in-1 Styling Treatment is the perfect first step before blow-drying to keep my hair vibrant and full of life all day long while the Oscar Blandi Texture and Volume Spray adds the finishing touch of volume and oomph. It's also great to use throughout the day if I'm going out in the evening and want that "just washed" fresh hair look. My favorite duo of them all has to be the discovery of what a beauty blender and the Urban Decay All Nighter Setting Spray can do together. 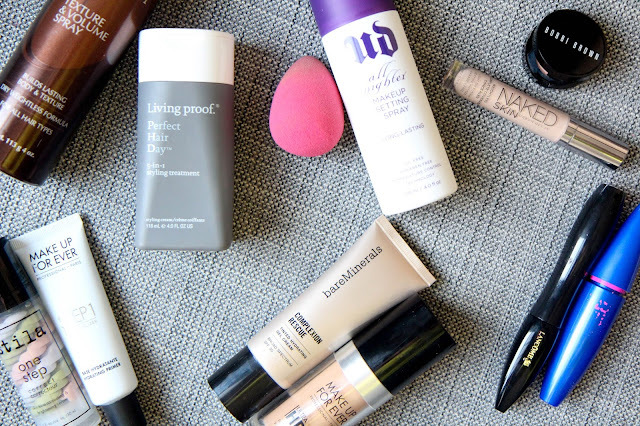 Spray some of the setting spray on the beauty blender and press in the makeup to know 100% that it's not going anywhere. I love doing this for long makeup days or when I really want everything not to budge. What products do you love pairing together?